My first post from Paris! How is food access different here than in the states? Well, for one thing, fruit and vegetable stands are everywhere!!! All over downtown, there are little fruit stands, like this one that is just across the street. Also, in the subway!!! 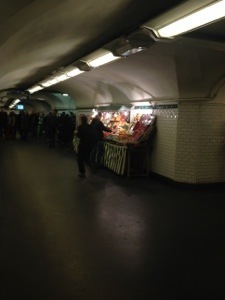 We came out of the Montparnasse station to find not one, but two fruit vendors! Thanks! Now that we’re over jet lag, we’re having a great time! I am so jealous right now. You better take 1,000,000 pictures and then post them. Eat cheese. Drink wine. Have fun!! Yes, ma’am, 1,000,000 pics coming up! Seriously, I am so full right now. Full and happy. Love this! In Delaware, they sell fresh produce from a local farm at one of the travel plazas. I guess that would be like selling it in the subway. 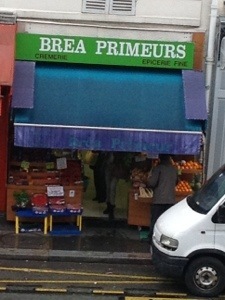 I think everyone should shop like they do in Paris–every day for fresh ingredients. Excited to see more of your trip! Yes, why don’t we do more of this??? Seems like such a great idea!